Good ‘n’ Fun brand contains a savory smorgasbord of flavors that dogs love most. These delicious chew treats are made from the finest ingredients, including premium beef hide and real chicken, to create truly delightful, long-lasting treats your dog will love. 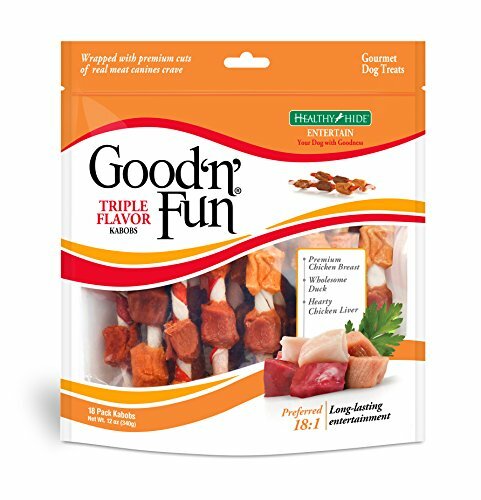 Good 'n' Fun Triple Flavor Kabobs combine irresistible flavors your pup will crave. These fun shaped chews provide long lasting entertainment that both you and your dog can be excited about. Each treat is made from pork hide and beef hide, then wrapped with real chicken, duck and chicken liver. With meat chunks they can see and flavor that lasts, these chews will have your dog coming back for more. Three great flavors combine into one gourmet dog treat. Keep chews fresh with the resealable bag. This pouch contains 18 kabobs. Kabobs are great for any sized dog. View More In Sticks & Twists. If you have any questions about this product by Good'n'Fun, contact us by completing and submitting the form below. If you are looking for a specif part number, please include it with your message.